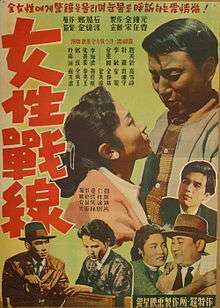 A Woman's War (여성전선 - Yeoseon jeonseon) aka Women at the Front is a 1957 South Korean film directed by Kim Ki-young. A melodrama about a housemaid who bears her employer's illegitimate daughter. The daughter visits her father on his deathbed, unable to tell him she is his daughter. ↑ "A Woman's War (Yeoseongjeonseon)(1957)". Korean Movie Database (KMDb). Retrieved 2008-01-22. ↑ Synopsis from "A Woman's War (Yeoseongjeonseon)(1957)". Korean Movie Database (KMDb). Retrieved 2008-01-22. ↑ Cast listing based on "일송정 푸른솔은 - The Green Pine Tree (Ilsongjeong pureunsoleun) (1983)" (in Korean). Korean Movie Database (KMDb). Retrieved 2008-01-22. "A Woman's War (Yeoseongjeonseon)(1957)". Korean Movie Database (KMDb). Retrieved 2008-01-22.